Enjoy All that Vail Has to Offer! Welcome to Vail! Our newly renovated cozy condo is located in the South (main) building of the Lion Square Lodge, which is directly beside the Eagle Bahn Gondola at Lions Head. We feel that the resort is one of the best locations in Vail for ski in/ski out as well as great shopping and dining diversity. See Lion Square Lodge's website to view a map of just how close we are to the gondola and Gore Creek (and the Gore Creek bike path)! From our front door, it is a ONE minute walk to the gondola. The two small bedrooms are equipped with queen-size beds. Additional sleeping space is provided by a full-size futon in the living room. Our bathroom includes a toilet, sink and shower (there is no bathtub). Four adults or a small family can share this 662 square-foot condo comfortably. There is NO view from our windows (we are at BASEMENT level with a view of a retaining wall); however, a quick walk up the stairs or an elevator ride to the floor above provides access to a balcony that overlooks Vail Mountain. You can enjoy coffee, tea or hot chocolate while watching the gondola go up and the skiers come down the mountain as well as keep an eye on the hot tubs and pool. Feel free to spread out to the leather couches in the lobby. El Sabor restaurant and bar is also located one floor above our condo. Enjoy great apres-ski specials or an extraordinary dinner without putting on your coat! In addition to the two incredible outdoor hot tubs and outdoor heated pool surrounded by gorgeous mountain views, the resort offers an indoor sauna and changing rooms - all located one floor below our condo. Further amenities provided by Lion Square Lodge include covered parking, DSL internet access, public restrooms and additional shower located in changing room, concierge, ski storage, bike racks and coin operated washing machines and dryers (in the hallway outside our unit). Visit the Lion Square Lodge website to learn more about the fabulous resort in which our condo is located. Not sure what to do in Vail while visiting? There are a variety of activities to enjoy while here, in addition to our favorite, world class skiing. Visit the Vail website listed below to learn more about year-round activities for which Vail is famous. Please note that parking for one vehicle is included in our rate. In addition, we do not charge any sort of 'resort fee.' We do, however, charge an $100 housekeeping fee to cover our costs. We try to set reasonable, fair rates for our guests and don't charge hidden fees. Thank you for taking the time to visit our site. We hope you choose to stay in our privately owned condo. To find out more or to make a reservation, please email us. We will respond within 48 hours to your message. Our bathroom includes a toilet, sink and shower (no bathtub). 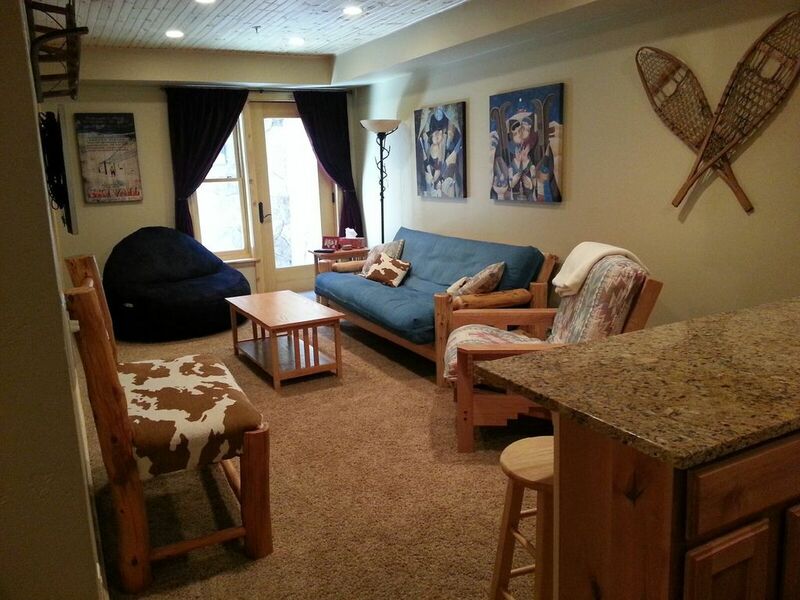 Great location and mountain to ski, will definitely re-rent. Condo was perfect for two people. With only one very small bathroom, I would not recommend more than two adults in the unit. It would be okay for two adults and two children as there are two bedrooms. It was exactly what we look for as location is key for us and we don’t spend a lot of time in the condo. Best ski-in/ski-out in Vail! Thank you Steve. We really appreciate you and your family visiting our condo since 2006. Hope you keep coming for another 11 years and more! The location of the apartment which was completely and truthfully described in the posting was worse than we thought. Had to go past laundry, housekeeping, and kitchen facilities to get to apartment. The apartment was underground, which again was accurately stated in posting. But no light and looking out to stone wall was depressing. We had barely warm water for showers so had to shower elsewhere. We also found a mouse in the bedroom on the last night. Definitely the cheapest room in an unbelieve area and beautiful lodge. But we found out you get what you pay for. We can certainly understand why someone would find a lack of hot water and a mouse in the unit to be inconvenient. When guests have had any complaints in the past (i.e., understanding how to use the TV, a clogged toilet - this is the first time we've had a complaint of hot water and a mouse), a quick phone call to Dennis or Katherine has resolved the issue quickly. That is why we provide our phone numbers repeatedly to our guests and ask that they call us with any concerns. Not only did this renter not contact us, she did not even attempt to notify the front desk. Had Julie W. either called or texted one of us, we would have had someone there immediately to assist her. Instead, we were told after she checked out that she wanted a refund or that she would post a negative review. Unfortunately, all we could do in hindsight was to have maintenance check the hot water and ask them to provide better preventive pest control. As I mentioned in my response to Julie, we talked with the staff at Lion Square Lodge after receiving her concerning email after her stay and they maintain that there was no problem with the water temperature that weekend. They also said that in the Vail mountain environment, on occasion a mouse will come into the building in the Summer, but they would have been happy to have removed it for our guest. Coming to us after the fact put us in an awkward situation since we had no opportunity to resolve Julie's issues during her stay. As one can see from previous reviews, we are very conscientious and accommodating to our renters, and we have many that return year after year. We apologize that Julie's stay was not what she expected, but we hope that when our guests encounter issues during a vacation that they notify us immediately. We want to make our guests' stays as comfortable as possible. This cozy condo was perfect for our family of 4. We stayed here for a vacation/work trip in Lionshead. The location was perfect. A lot of restaurants and shops are nearby, and being able to walk or ride the bus to Vail village was nice as well. The owners were very helpful and flexible. The only awkward thing to deal with is that you are in the basement right next to the big laundry/break rooms etc for the Lodge. It was a little noisy during the kids' nap times, but other than that it was a nice, clean, quiet place to stay for a few days. Our family enjoyed our time here. Thank you! Great Easter vacation in Vail! We have stayed at Lion Square Lodge several times, but this is the first time we chose a place using VRBO. There were 6 of us traveling together, and this small basement apartment was cozy yet comfortable for all of us. The owners, Katherine and Dennis, were very responsive and flexible. That really meant a lot to us! We had absolutely no issues, and you just can't beat the location at Lion Square Lodge. You step outside and are at the Eagle Bahn Gondola. You are also walking distance from all the great shops and restaurants in Lionshead. If you are looking for a great location at a decent price, you should definitely consider this unit!! We are located in the Lion Square Lodge resort in Lionshead Village.